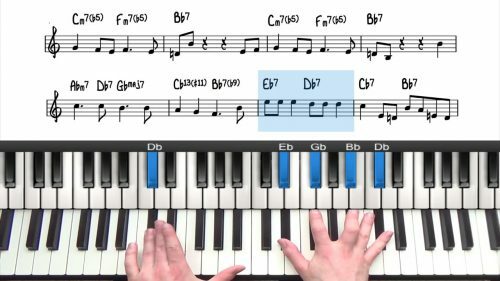 In this lesson, we will create an arrangement for the tune "Wave" by Antonio Carlos Jobim. This is a song that Jobim composed whilst in the United States. According to Jobim, the song was written as a ‘love letter’ to his hometown of Rio de Janiero. He was thinking of all of the things that he missed such as the beach, the waves, and the ocean. "Wave" was a huge hit and quickly became a jazz standard. Often, the changes that you find in the Real Book are not completely correct and in this lesson we will use the chords played by Jobim himself. Like many of Jobim’s compositions, there are lots of minor 6th chords, and also many beautiful inside chromatic lines which we have explored in the other Jobim compositions. Practice vamping over the last 2 bars of the tune which is D-7 to G7. This 2 bar vamp can be used both as an intro and an outro. 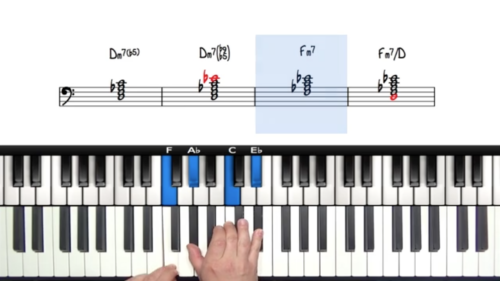 As with the previous lessons in this course, you should first learn to accompany the tune. This will allow you to identify the inner voice possibilities within the harmony. Experiment with the melody in different registers of the piano. In this arrangement, we play the melody an octave higher for the 2nd A Section.